Is one city big enough for the two of them? Is one league big enough, for that matter? Two years working in direct opposition in La Liga aroused enough ill feeling to last Jose Mourinho and Pep Guardiola a lifetime. Now, it seems, they will be living cheek by jowl in Manchester. Oh, Pep, are you really prepared for the ultimate noisy neighbour? Mourinho's imminent appointment as Manchester United manager is intriguing on so many levels - the club of Matt Busby, Bobby Charlton, George Best and Alex Ferguson eschewing its romantic values in opting for the ultimate pragmatist to restore it to the glories of the recent past. But fast forward to Aug 13 and a new Premier League season dawns. Manchester City have placed their faith in Guardiola, the idealistic dreamer who was the architect of the modern-day Barcelona. United have moved for his polar opposite as they called time on Louis van Gaal. Somehow it is hard to imagine Mourinho and Guardiola staying in the same luxury apartment block, or perhaps even frequenting the same shops and restaurants in the same leafy Cheshire village. The two men cannot stand the sight of each other. One of them, Mourinho, thrives on antagonism - or at least appears to think he does. The other, Guardiola, would be forgiven for feeling slightly queasy at the thought of renewing their bitter rivalry. Guardiola (above) is all about beautiful, free-flowing football - relentless pressing and penetrative possession as the first and second means of defence. Mourinho favours control and organisation, building his teams on a foundation of physical and mental fortitude. Both are serial winners, the best of their generation, but one seeks to win beautifully, the other by any means possible. It is a clash of personalities and a clash of football ideologies. Guardiola is all about beautiful, free-flowing football - relentless pressing and penetrative possession as the first and second means of defence. Mourinho favours control and organisation, building his teams on a foundation of physical and mental fortitude. Both are serial winners, the best of their generation, but one seeks to win beautifully, the other by any means possible. And it cannot sit too easily with every United supporter, after the complaints about the lack of thrills under David Moyes and van Gaal, that they have appointed the one who appears rather less attuned to the club's cavalier traditions of youth and adventurous, exciting football. Mourinho is commonly described as a "box office" manager. His press conferences might meet that description when he is in the mood - and the mood in question is often provocative, mischievous or more malicious - but the on-pitch entertainment seldom does. He is a dressing-room manager and, above all, a trophy-room manager. And there is much to be said for that when, for a club of United's size, stature and aspirations, the FA Cup that van Gaal delivered at Wembley on Saturday evening represents a meagre return for the miserable three years they have endured since Ferguson's retirement. United would have appointed Mourinho only from a position of weakness. They gave him a wide berth in 2013, believing him to be too abrasive and not respectful enough of their traditions. While the club regret the appointment of Moyes in succession to Ferguson, it could equally be stated that Mourinho's second spell at Chelsea - which featured a Premier League title and a League Cup but ended with the usual complaints about playing style, dressing-room discord and a distrust of youth - did little to suggest that United's initial evaluation of him was wrong. Mourinho will relish the thought of locking horns with Guardiola again. He is one of the few rivals to have succeeded in getting under the Spaniard's skin. It did not seem to do him much good when it came to results in their head-to-head meetings - Mourinho has three wins, five draws and seven defeats to show for their 15 encounters to date. But he treasured every victory over Barcelona, most notably for Inter Milan in the Champions League semi-final in 2010. After Mourinho's arrival in Spain, with Real Madrid, Guardiola found their conflict draining. The resumption of their rivalry on English soil will only add to the narrative of the Premier League soap opera. Mourinho will thrive on that, at least for the first year or two. Guardiola will find it infuriating. He will try to rise above it, as he did in Barcelona, where he stopped only to deride Mourinho as the "f***ing chief, the f***ing boss" when it came to media mind games, adding: "It's the kind of game that I won't play because I can't do it." Guardiola believes in box-office football. At City, who laboured for much of their final two seasons under Manuel Pellegrini, he will demand energy, intensity, intelligence and incisive, fluent attacking football. He seems certain to inspire a team who finished 15 points adrift of Leicester City at the top of the Premier League. Improvement now looks inevitable at United too. This is a club crying out for the kind of inspiration and leadership that van Gaal failed to provide. It is crying out for a vision too, though there will be questions about whether Mourinho's is the right one for United. He likes his teams to be full of proven competitors at their physical peak, who are able to use brains as well as brawn. There are not too many of those in this United squad. 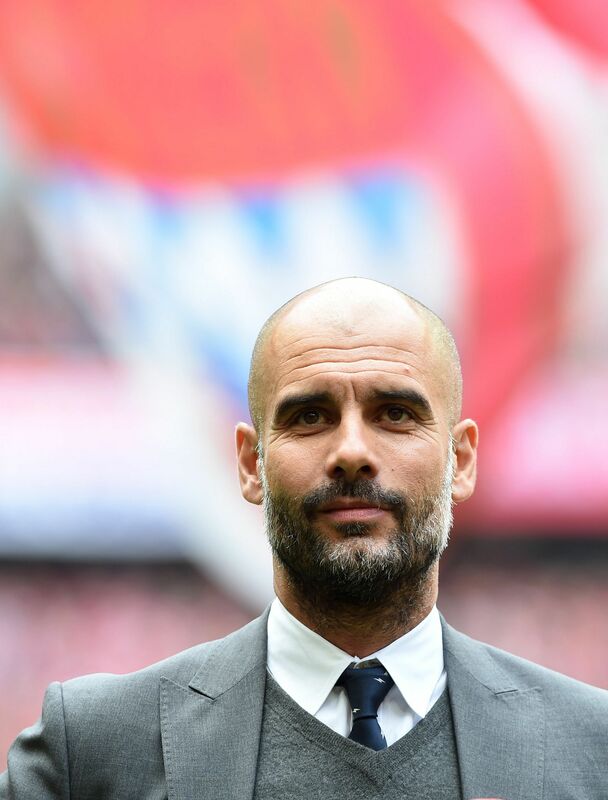 Guardiola will try to embrace and foster the "holistic" approach to which City have aspired. Mourinho will look to make United the noisy neighbours, to borrow Ferguson's infamous put-down of post-takeover City. Is Manchester big enough for these two fierce adversaries? It seems we are about to find out.